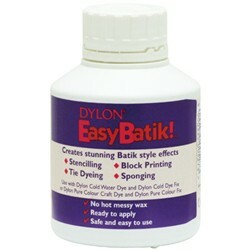 I’ve got the urge to batik, and seen this stuff online, Dylon Easy Batik. My question is: have you ever tried it out, and how did you find it to use? Posted on Saturday, October 13th, 2012 11:47 am by MixyPosted in textile artTagged batik, dylon easy batik, fabric dye, fashion, textile. Next Next post: Hi Folks! I’ve never heard of it, but perhaps it’s cold wax? That’s just what I thought! I’m gonna give a go – watch this space! Sorry, haven’t tried it. I’ll send out a few feelers, but I don’t think I’ll come up with anything. Most of the people that I know do the ‘real thing’. Dylon is a good name, though, and their products are usually good.